Tender annual. Hot, green fruits. Become sweeter when ripened to red. 65-75 days to maturity. 100 seeds. Named for Jalapa, Mexico. Widely used in burritos, tamales and for "poppers". 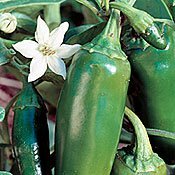 Thick-walled green fruits become sweeter when ripened to red and are known as Chipotle when smoked.